your G5 with out accelerating your heart rate. The last couple of months have brought me such a flood of new hardware and software, all begging "review me", that my usual state of clutter has turned into chaos. So, here it comes - a couple of mini-reviews of recent additions and upgrades to the FCP users tool kit. I'll just concentrate here on how I got the beast running along with some random observations on FCP 4 and the dualie. 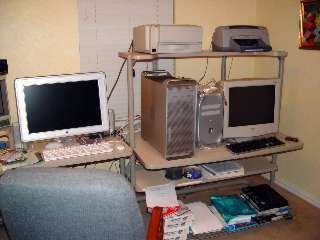 My primary machine was a Dual 800 with almost 70 gigs on its start up disk and two internal 120 gig media drives, each with about 65 gigs of media. I decided to transfer everything from the G4 to the G5 rather than reinstalling all of my programs and rather than removing the internal G4 drives and putting them in firewire enclosures. But the first task was the configuration of the beast. I booted the G5 and ran it for a couple of hours just to make certain that I was not dealing with a DOA. I decided to wait until after the data transfer before adding RAM as well as an additional internal SATA drive. My plan was to clone the start-up drive of the G4 to the G5, get the G5 running with all apps, and only then to install RAM and the extra media drive. This would rule out any third party hardware variables should I begin to experience problems. I first prepared the G4 drive by repairing permissions and by running Disk Warrior. Disk Warrior determined some directory anomalies, so I replaced the directory using Disk Warrior's functionality. I then ran DW again just to make sure. 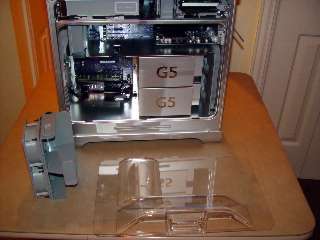 In preparation to begin the cloning and reinstallation of system software on the G5, I inserted the G5 software restore DVD (contains the OS plus bundled applications) and shut down the G5. This would ensure that I could boot from the G5 once the data was cloned. Remember that the G5 could only boot from a G5-specific version of Jaguar. Next, I connected the G4 and G5 with a firewire cable and booted the G5 in target mode (start computer and hold down the T key). 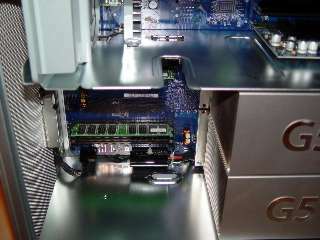 The G5 booted in target mode and its hard drive mounted on the G4 desktop. Next in line was a total reformat of the G5 disk using Disk Utility. Now, starting with a clean disk, I used Carbon Copy Cloner 2.2 to clone the G4 disk to the G5 disk. I did not clone the OS 9 system folder, recalling that I read in an Apple TIL that one should not copy an OS 9 folder to another disk. That would be simple to remedy anyway, since the G5 system restore DVD includes a Classic installation option. After two and a half hours of churning and listening to the G5 fans at full blast (that's what happens in FW target mode since there is no OS to regulate fan activity), the operation was complete. I unmounted the G5 icon from the G4, shut down the G5, removed the firewire cable and rebooted from the system restore DVD I had left in the computer (hold down the "c" key at start up). When the OS X installer finished booting, I chose the Archive and Install option with preserve users to install a new OS while retaining all of my user settings. Then, with heart pounding, I booted the G5. It came right up with all my user settings, passwords and applications. Any "haxies" would, of course, disappear, so I just needed to reinstall Dave and Little Snitch and they worked. Now, to launch FCP 4. Well, the docked bounced and nothing happened. So, I reinstalled FCP 4 and did the upgrade to 4.0.2. FCP, Compressor, Sound Track and LiveType came right back as they were supposed to do. I experimented with just a few pieces of media I had on the start-up drive, and FCP was stable. I also noted that there were two installations of Safari on the system, one on the desktop where I had installed it on the G4 and another in the Applications Folder, which was a more recent version installed by the new OS 10.2.7(G5). I deleted the earlier Safari application. As a note for other users who may try this one at home, remember that you might have to de-authorize certain files and applications on your old computer and re-authorize them on the new computer. This would include any songs purchased from the iTunes Store, applications which base their license on the host machine's Ethernet address, or applications licensed specific to a computer such as Quark 6. I do own Quark but since I am keeping the G4, it was not worth the effort when I had more pressing matters at hand. Now came the fun part-to descend into the belly of the beast-to rip into the G5. It reminded me of my youth when my greatest joy was disassembling anything mechanical I could find. The G5 is such a joy to disassemble. ...was disassembling anything mechanical I could find. I added another gig of RAM, remembering from a prior RAM installation I had done in another G5 that a little extra pressure is needed to seat the DIMMS. Put computer back together and the RAM was not recognized. Took computer apart again and reseated the new RAM. The second time did the trick. The next day, my Hitachi 250 gig SATA drive arrived and I got to disassemble the beast again. The hardest part of the hard drive installation was removing the four mounting screws that Apple includes by the lower drive bay. I then slid in the drive, connected the two SATA cables, twirled down the retaining lock and the whole installation took less than 30 seconds. ...the whole (Drive) installation took less than 30 seconds. Disk Utility recognized the drive and it formatted to 239 gigs. Now, back to the old firewire target mode. Something is quite different here with the G5s. 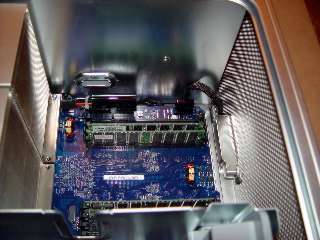 Prior to the G5, firewire target mode only recognized the startup drive of the target machine. Now, any drives mounted on the target machine will mount on the source machine. So, my Hitachi drive came up and I just did a drag copy of the contents of the two G4 media drives. Several hours later, everything was there and I could resume editing with FCP. Panther Day arrives and my up to date version of Panther showed up at 3 pm. While it did not have a "do not open until 8 pm or next Chanukah, whatever comes first" label, I was very dutiful and did not open until after 11 pm to make certain that I was in compliance with Apple law in as many time zones as possible. I had already begun to feel better about Panther after Apple's release via software update of the QuickTime 6.4 render plug-in. Again, with heart pounding, I began the installation of Panther late on Saturday afternoon. I again selected the archive and install method in order to install a new OS and at the same time retain my user settings. I also did a custom install to eliminate the foreign languages I did not need as well as iTunes (already had the new version) and iMovie. Installation took 20 minutes. Panther booted the first time-and much faster in booting than Jaguar. Software Update found the QuickTime MPEG2 playback component which the QT 6.4 installation removed, but did not find the FCP render plug-in. Furthermore, while FCP would launch, Compressor was grayed out. This is to be expected in an archive and install since the Qmaster render engine is one of those system "haxies" that an archive and install deletes. I did a custom reinstall of FCP 4 and Compressor. Software update then found both the QT 4.0.2 update as well as the FCP 4 render plug-in. Now, FCP 4 launches. Final Effects Complete does not crash at start-up even with QT 6.4. No SPOD shimmers when working with long master clips or when placing animation codec in a DV sequence. All was well with the world until I applied Boris 3GL and got an instant crash. In fact, I crashed about 10 times in a row and decided this means the crash is repeatable. Panther now has a crash reporting feature and each time I sent that crash log to Apple. I then decided to take a look at that crash log myself and noted that it seemed to occur when Boris Red was building its font menu. It was at that point that I realized that I had not deactivated Font Reserve, which I have used for font management since the day it was released. I turned off Font Reserve and relied only upon Panther's Font Book for font management. Boris then applied without incident and I have not crashed since. Therein lies my major disappointment with Panther. Font Book is cumbersome and nowhere near as robust as Font Reserve. I hope a fix comes soon or at least an easy way of disabling Font Book. Finally a few subjective comments. The entire system feels peppier since the installation of Panther. FCP definitely seems faster and it already was fast on the G5. I await the G5-optimized version of FCP to determine how much speed it gains in this optimization. FCP 4.0.2 with Panther and the render plug-in seems stable. I have been pushing it hard and it has neither crashed nor hung. My heart rate has returned to normal. 1) Repair permissions on your source disk. 2) Run a utility like Disk Warrior on your source disk and run it repeatedly until no errors are reported. If you do not have Disk Warrior, at least boot your source computer in single user mode (command-s) and at the prompt type "/sbin/fsck ­y". Hit enter. If fsck reports repairs to the file structure, repeat the procedure until there are no more errors. Then type "reboot-n" and enter. 3) Re-initialize your target drive while in FW target mode and don't forget to insert the new machine's restore CD or DVD prior to beginning the process to make certain you will be able to boot. 5) Be prepared to reinstall any applications which do not function properly. 6) Do not be afraid to upgrade to Panther. But make certain that you have repaired permissions or even run a disk repair utility prior to installation. 7) Double check that your applications and all their components run after the Panther installation and reinstall anything that produces unexpected results. 8) Be careful in the use of font management utilities which could conflict with Font Book by double-opening fonts. Best to disable Suitcase or FontReserve until a workaround is found. 9) It is also advisable to look at Apple's suggestions for worry-free system updates. That's all there is to a very painless migration between a G4 and a G5 along with installation of the new operating system on the G5. Never have I found configuring a new computer and updating an operating system to be so seamless. In my next installement, I'll highlight some new software goodies for you.